Is your social calendar reaching maximum capacity for the next couple of months? Take time to plan out what you’re wearing ahead of time, so you know early on what you need to shop for. MSL is here to help! As promised, here is Part 2 to our special edition of Ask Our Style Techs — this time we are answering reader questions about how to look your best at evening events and celebrations. Let the party begin! Q: Corks for Kids is an annual fundraiser for the North Central Parenting Group (NCPG) in Phoenix, Arizona on Saturday, April 26 at the Phoenix Country Club. This event helps NCPG fund its great activities, facilities and instructors. In addition, Families Giving Back will receive a portion of the proceeds from the event. Families Giving Back works with other non-profits in Arizona to organize events where parents and their children can work together. Any suggestions on what I should wear?? A: We love that this event helps parents be better parents AND raises money for an amazing charity! This calls for an eye-catching, classy cocktail dress. With a detailed, vibrant print such as this dress by Milly, keep your shoes and accessories complimentary, not competitive. This unique dress has that special factor all on it’s own without a lot of accoutrements. If you prefer to go solid, we have a color-blocked dress we recommend as well. Dress, Milly. Shoes, Charles David. Handbag, Fendi (on sale!). Bracelet, Vince Camuto. Q: My parents are holding a special vow renewal ceremony in honor of their 50th wedding anniversary at their country club in April in California. The ceremony is in the late afternoon outside, followed by a sit-down dinner. What should I wear that is outdoor-appropriate, but also dressy enough for the occasion? A: 50 years?! First of all, a big congratulations to your parents! That is a huge milestone and accomplishment. 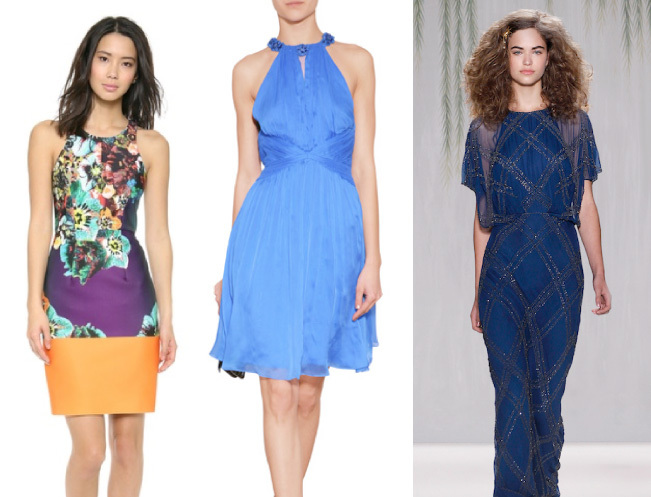 We suggest a brightly-colored, halter-style dress that will transition smoothly from day to night. 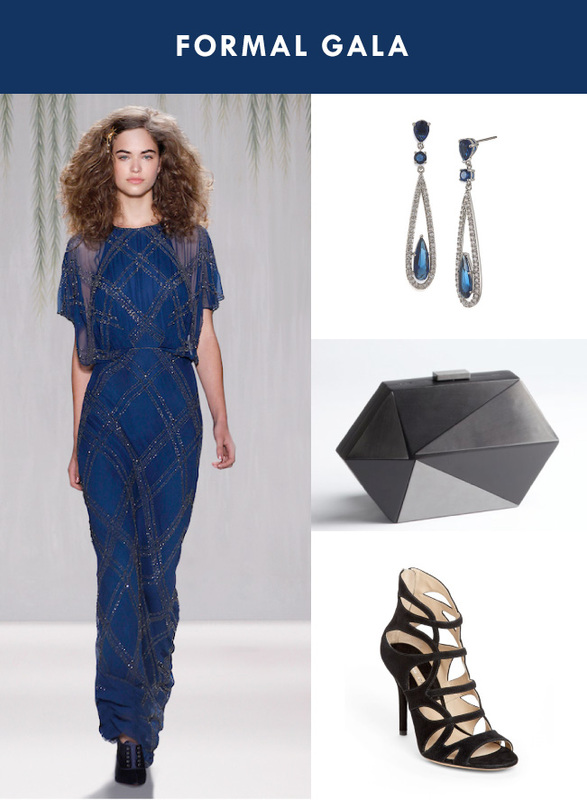 Punch up the look with some fantastic, embroidered booties and style with a metallic clutch and elegant cocktail ring. Dress, Matthew Williamson. Shoes, Valentino. Handbag, J. Crew. Ring, Merdinger (on sale!). Q: I am the co-chair for a fundraising event and the attire is evening formal. Any suggestions on what to wear that might be different and special? I prefer a sleeve. A: While the focus of the night is on the charity you are raising money for, it is also a culmination of all the hard work done by you and your volunteer team, and you all deserve a big round of applause. That said, the spotlight will be on you, so you want to feel beautiful and be prepared for the event paparazzi. Formal gowns with a sleeve that are still modern are often tricky to find, but this Jenny Packham dress offers the coverage you seek with it’s sheer sleeve and doesn’t sacrifice even an ounce of style. Keep your shoes and accessories more edgy. Dress, Jenny Packham. (Optional Dress, Adrianna Papell (on sale!). Shoes, Michael Kors. Handbag, Sondra Roberts (on sale!). Earrings, Carolee.